At the moment, all that is on the TV in Japan is either the 台風 (typhoon) that is hitting the Tokyo area today, and the national election results. Tokyo is in the path of the approaching typhoon. Be careful if you’re on the east coast of Japan and you have to go out today. The weather will be bad all day today, but it’s forecast to be nice tomorrow (normally, after a typhoon passes the sky is very clear). Regarding Japan’s election today, the results are still not all in yet, but it’s winding down and the 民主党 (Democratic Party of Japan (DPJ)) is winning in a landslide. This is an upset victory because the 自由民主党 (Liberal Democratic Party (LDP)) has won nearly every national election in Japan since the end of WWII. The current Japanese Prime Minister (Taro Asou) is the president of the LDP. 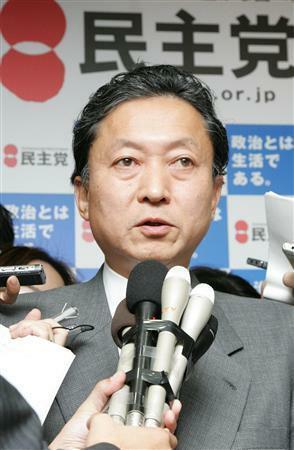 The next Prime Minister of Japan will more than likely be 鳩山由紀夫 (Yukio Hatoyama).